A virtual private network (VPN) secures the Internet connection and puts the user in control of their browsing session. It protects the user against lurking cyber criminals and unwanted marketers who target by IP addresses, thwart attempts by ISPs and the government to monitor and regulate online activity, helps to access banned sites, and do more. The Moldova based Kepard VPN is a relatively new and small VPN provider, having launched its business operations in 2012. It offers 100+ IP addresses from 13 secure servers spread across USA, UK, France, Netherlands, Germany, and Canada. The offering is compatible with Windows, Linux, MacOS, iOS, and Android platforms. Kepard offers a vanilla package that includes unlimited traffic, unlimited downloads, and unrestricted server switches. Users have the option of subscribing for packages of one, three, or 12 months. It is possible to connect from two locations simultaneously with a single account. The protocols available on Kepard VPN are PPTP, L2TP/IPSec and OpenVPN. The encryption depends on the protocol. The OpenVPN protocol comes with Blowfish 160 bit key encryption, the PPTP protocol comes with 128 bit MPPE-key encryption, and the L2PT protocol comes with AES+SHA1-key encryption. The offering comes with NAT firewall as well. The system retains log-in and log-out times for three days. Here is a larger Speed Test of Kepard and other VPN Providers. 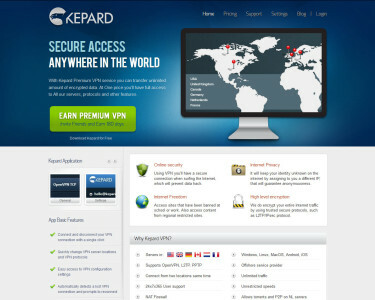 Unlike many offerings that promise high speed VPN, Kepard VPN has a maximum speed of 30Mb/s. Also, unlimited P2P and file sharing is limited only to servers located in Netherlands. Kepard however makes up for such shortcomings by its simplicity and strong support. The company offers 24x7x365 customer support, which makes installation and troubleshooting easy. However, customer service is rarely required, as most functions, including connection, disconnection, and server change is possible with a single click of the button. Access to server configurations is easy. The system automates many functions, including reconnection prompts and server location updates.